Before 1988, no one had heard of them. Today, they dazzle people on every continent: crosses of light suddenly appearing in windows. Even science has taken an interest. In a tiny church in Knoxville, Tennessee, they seemed to be 30 or 40 feet high. Weeks before the first one appeared, Benjamin Creme announced that Maitreya was going to amaze the world through a highly unusual light phenomenon. The first cross of light appeared in 1988. "Last weekend," the Pasadena Star News wrote on 27 May, "residents reported seeing a cross shining through a bathroom window of an apartment in El Monte." Eye-witness Mona LaVine stated she saw: "A cross of a pale golden light -- and simply beautiful." Margaret Romero, owner of the place, had the glass replaced by a neighbor�s window, but the cross kept shining. Within days, 12 more crosses appeared around the Los Angeles area. Two years later, four foot-tall crosses of white and gold light appeared suddenly in the bathroom window of a 61-year-old pipefitter living in a suburb of New Orleans. In 1991, the crosses reached the Philippines. Reporters of Newsday Philippines got hold of a piece of glass with such a cross of light. News editor Julian V. Cruz wrote: "It was mid-afternoon. With a score of neon lights on and sunlight streaming through two windows, there could be no occasion for hocus-pocus. The piece of glass was set up on its box like a picture frame. It looked exactly like any other piece of frosted glass, almost opaque, one could not see through. A flashlight was pointed at it and switched on and there appeared this even-armed cross of light seemingly within a diamond-shaped aura. Somebody placed another switched-on flashlight beside the first and two crosses appeared. The flashlights were switched off. The crosses disappeared. They were switched on again, the crosses reappeared. The usually boisterous newsroom was silent. The phenomenon was awe-inspiring, or, at the very least, intriguing." On Easter Sunday 1991, a picture was taken of the Philippine piece of glass containing a cross of light. When the negative was developed, the image of a hand showed up in the glass. 5. "It�s another life for me"
"Most of the people we have interviewed are very devout, and most of them are quite poor. Typical was the family of Magdalena and Paulo Robledo, who have five children and live in a tiny two-bedroom home. There are regular weekly prayer meetings now in the Robledo's little house at which the participants pray for Christ to appear to them. Those who attend say they feel the spirit strongly in the room." "Laura, a teenager who had tried to commit suicide and had been a real problem to her family, came to see the Robledo's cross. "I feel like another person," she said later. "It�s another life for me. I�ve changed... I used to be a real meany to everyone... Now I want to help everyone. I believe in myself and I have hope." 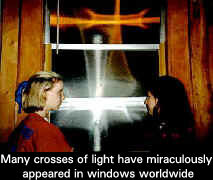 Simultaneously, three crosses appeared in the bathroom window of Alejandrina Carmona in Montecito Heights, California. Carmona said she could sometimes also see the Virgin Mary and Jesus. At the home of Leo and Loretta Alphonso in Violet, Louisiana, a radiant panorama of crosses appeared, elaborate foot-tall figures tapered at the ends and appearing to set off in the distance. Three of them were glowing in white and one in gold. Some saw a red cross floating past the others. As a result of Benjamin Creme�s visit to Auckland, New Zealand, in February 1994, crosses of light appeared in three windows of the house in which he stayed. 9. "Sign of the Second Coming"
"Hundreds of people have visited the home of Carlos and Ines Alvarez in Bakersfield, California, since the couple discovered a large cross of light in their bathroom window on 7 March," the Bakersfield Californian wrote in 1996. "A lot of people think it�s a message God is trying to send us because we�re in the last days," said Mrs Alvarez. According to the article, the family said a priest told them the cross was a sign of the Second Coming. "I can�t get the hair on the back of my neck to do anything but stick straight out these days. The crosses are indeed in the windows at the Copper Ridge Baptist Church. That is a fact. It doesn�t matter if you believe it or not...," wrote columnist Bob Hurley of The Greenville (Tennessee) Sun, reporting on the gigantic crosses of light which had appeared in Knoxville, Tennessee in and outside the tiny church of Reverend Joe Bullard. It all started one evening in early November 1995, when Joe and his wife Mildred noticed a radiant white light seeming to surround the entire building. A couple of days later, on 8 November, Joe Bullard was addressing his congregation. While he stood talking, a bright white light appeared on one side of the church. On further inspection the light was found to be in the shape of a large cross. Bullard's reaction, and that of the thousands of people who later came to see the crosses, was "unbelievable!" Reaching a height of some 40 feet, the crosses could be seen in all the church windows. Children and adults alike were glowing with joy at the phenomena they experienced there. Scores of people told Reverend Bullard they were being healed emotionally, spiritually and, sometimes, physically when they saw the crosses. A deliriously happy Joan Anderson told the Kokomo Perspective newspaper in October 1996 that she had an inoperable brain tumor, went to Knoxville more or less by chance, knew nothing of the supposed healings, and realized the following day that her headache had gone -- and, the doctors soon discovered, so had the tumor. In the summer of 1996, seven crosses of light appeared in Slovenia in Novo Mesto, Koper, Ljubljana and Lenart.